Choppy waves of golden wheat field blowing in the wind as the hot sunlight shines down! June is the season of harvesting wheat. However, you might not know that to look at the Korean countryside, where what were once vast fields have disappeared in the face of overwhelming imports. Staff and executives of CJ Food Ville are committed to delivering the preciousness of season foods by maintaining the traditions of Korean food! 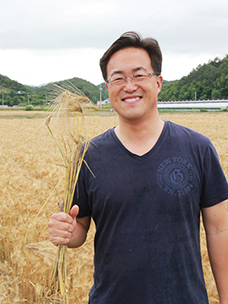 CJ Creative Journal will cover their visit to Jinju-si, Gyeongsangnam-do, Korea to harvest cripple wheat. because it is so low in gluten. The reason why Cripple wheat, in spite of many health benefits, has not been widely known is because it's difficult to process. Despite the brief success of an advertising campaign for eating Korean wheat in the 1990s, only Keumkang wheat, the improved variety of Western seeds, caught the public eye. The fact was that the flour mills used at factories were by and large optimized to process imported wheat. This is why Keumkang wheat, which is so much more similar to imported wheat, was used in favor of Cripple wheat. Unfortunately, Cripple wheat have a different volume and glutinosity than imported wheat, leading the public to lose interest. Yet, the tradition of Cripple wheat was kept by families who had a either a farm or plot of land to grow it by themselves and by some consumers who remained in the know about its delicate flavor. 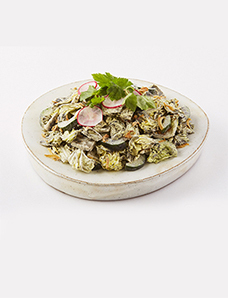 "Season's Table," which delivers the preciousness of healthy and delicious seasonal foods using traditional Korean food ingredients, has developed and introduced various foods using Cripple wheat. Now, Season's Table has entered into a contract farming agreement with farmer Cho Young-ho in Jinju-si, Gyeongsangnam-do. For this year’s Cripple wheat and barley harvest, around 30 staff and executives of CJ Foodville went to Jinju to lend a helping hand. 26 staff and executives of CJ Foodville gathered in front of the head office of CJ Foodville early in the morning on May 31. Their destination was the fields of Cripple wheat and barley in Jinju-si, Gyeongsangnam-do. They left for the region to help harvest the Cripple wheat cultivated by farmer Cho Young-ho, as well as lending a hand to clean the village and, of course, enjoy the time together with senior citizens living nearby. The big boxes they carefully prepared contained delicious food ingredients to eat together with senior citizens. What would the day's lunch menu be? Let's go to Jinju and find out! Before beginning on schedule, they decided to shout the Korean motivational phrase "fighting". Working together would be the only way to achieve all that they wanted to do: enjoy a meal time with senior citizens and undertake the large wheat harvest. "Fighting!" was soon followed by a voice saying "I’m hungry. Before all that, let’s eat!" The day's lunch menu was the masterpiece of the staff and executives of CJ Foodville! They prepared the most popular items on the menu of Season's Food, making a delicious lunch using Cripple wheat, the hero of the day, in order to show the senior citizens the faithful taste of Season's Food. which they would grill the meat. Their deft fingers helped to grill the meat impressively. People’s mouths watered at the sight of the popular menus from Season's Table sizzling in the open air! The team in charge of grilling meat was working up a sweat in front of the hot charcoal on the hot summer’s day. However, smiles didn't leave their faces in spite of the sultry weather and red hot charcoal heat. Another team griddled corn pancakes with Cripple wheat flours and corn kernels. The sweet and delicate taste enjoyed at Season's Table was completed by Cripple wheat to create a stickier and more delicate taste. Another delicacy made with Cripple wheat was sujebi, a clear soup with dumplings! The team making sujebi worked together with senior citizens in the neighborhood. The refreshing and deep taste of the soup was completed by the cooking skills of the senior citizens. While senior citizens were making soup, the staff and executives of CJ Foodville mixed flour and water, and kneaded the dough. Even if they worked hard, they couldn't imitate the chewy and soft texture of the dough that senior citizens made so quickly and easily. This suggests that cooking skills very much grow with age! They tried to follow the deft touch with which senior citizens kneaded the dough. The soup was now boiling, and the rest of the lunch had been fully prepared. Next it was time to serve the dishes on the table and dine alongside senior citizens, as well as delivering lunch boxes to senior citizens who had problems with mobility. While lunch food was being prepared, senior citizens sat around the tables at the cafe run by the farmer, waiting for lunch to be ready. Meanwhile, another team was working on spreading a large mat on the yard to have a meal together there. Steamed rice and side dishes were neatly packed into every lunch box. They hoped senior citizens would relish the lunch meal they prepared with such care and sincerity. Finally, lunch time was here! "Did you make it? You're so good with your hands. Great!" At the unexpected praise, the employee smiled shyly. Although the taste couldn't match the food the senior citizens could make with their hands, the staff and executives really appreciated the way they savored the lunch. It couldn't get better than a meal time together with senior citizens in the clean, fresh air. The food was so tasty! The senior citizens enjoyed Spicy Grilled Pork Belly and Corn Pancake with Cripple wheat, the two best items on the Season's Table menu. While having a friendly talk with each other, they had soon finished a bowl of rice before they knew it. They particularly loved the sujebi, which features a refreshing soup and the delicate flavor of Cripple wheat. “Oh, Thank you!” ^^ They didn't hesitate to open their mouths wide in order to help themselves to those leaf wraps without regrets. They shared a touching moment that seemed to remind them of their lives growing up. Some of the lunch boxes, meanwhile, were directly delivered to mobility-impaired senior citizens. Almost all young people had left for cities, but many elderly people remained in the village. They said they felt so happy to see passersby because of being alone almost all day. Staff and executives of CJ Foodville brought them lunch boxes and asked whether the food suited their taste or whether there was anything troubling them. Also, CJ CheilJedang prepared various kinds of food ingredients as gifts for senior citizens. Those gifts were also presented to senior citizens together with lunch boxes and roll cakes. The senior citizens waved their hands and said, "We are happy to just see you. You don’t need to bring anything." At seeing them, the staff and executives of CJ Foodville thought about their own grandparents and vowed to visit them more often. Why don't you call your grandparents on the phone this weekend? A surprise visit always goes down well! After everyone had enjoyed the food and finished putting things in order, it was time to harvest Cripple wheat and clean up the village. As wheat and barley originally grew in the same field, they were supposed to harvest the two things at once. Two teams were organized – one to harvest wheat and barley, and the other to clean up the village. In the meantime, the wheat and barley harvest was in full swing in the field. Cutting wheat and barley was a strange experience to those who were accustomed to urban life. They looked slightly awkward as they held a sickle for the first time in their lives. Everyone was able to learn something from the wise advice shared by the senior citizens in the fields. The curiosity and passion on the faces of CJ Foodville's staff and executives somehow seemed more reminiscent of a serious classroom course! Moved by young people listening earnestly to his words, the senior citizen offered them a more detailed explanation about how to really harvest Cripple wheat the right way. Softly wrap the wheat with a hand, and cut it deliberately! That’s a lot easier said than done, especially for those who’ve never cut wheat before! But, sure as practice makes perfect, by the end of the day, their wheat cutting skills were a sight to behold! The value of traditional Korean food ingredients, the healthy and delicious life season's food, and the proud of sharing the experience of a "pleasant table" with more people! Season's Table takes all these things very seriously. It was a pleasure to see Foodville's staff and executives turning their hand to the harvest of traditional Korean Cripple wheat in order to carefully place it on the table for customers. Go Together with the Farmer Sincerely! They prepared a memo board to present it to the farmer Cho Young-ho as a gift. Their feelings after visiting Jinju and seeing the Cripple wheat field were plain for all to see in their Polaroid pictures that they had pinned to the memo board one by one. This suggests that CJ Foodville's staff and executives thought of farmer Cho Young-ho as their precious partner, who had shared the value of traditional Korean food ingredients with Season's Table. a full-size poster of him. The full-size poster board of farmer Cho Young-ho looked better than that of singer Seol Hyun! CJ Foodville's staff and executives posed alongside the full-size picture of him, our farmer of our land. They had even cleaned up the village in their spare moments. Walking around the fields and town, they picked up garbage on the ground. They also cleaned the waste from the spaces between the bushes. CJ Foodville's staff and executives, having finished harvesting Cripple wheat and cleaning up the village, poured water over their back and washed their feet at the end of the day. The water was very cool and clear because it was drawn up directly from the underground. They had the feeling of times in their youth when they would have a great time in the countryside during the school break. Farmer Cho Young-ho prepared a drink made with the powder of roast barley. It's very cool and refreshing enough to suit the nickname "Barley Latte." The drink has two times more delicate flavor and a hundred times more nutrients thanks to the powder of roast barley! They drank it down in a single gulp, and cheerfully asked for another! For the finale of the day, CJ Foodville's staff and executives presented a prize certifying the "protector of Korean traditional food ingredients" and a carefully-prepared memory board to farmer Cho Young-ho who had worked so conscientiously for the "Happiness Sharing Day." Senior citizens in the neighborhood as well as CJ Foodville's staff and executives gave him a rousing applause. There was a shy but proud smile on his face. All of them felt proud of the farmer who had dedicated himself to protecting traditional Korean food ingredients, despite many difficulties. They gathered together to take a picture commemorating the day, and smiled broadly with a feeling of satisfaction and joy, shouting "smile" in one voice! 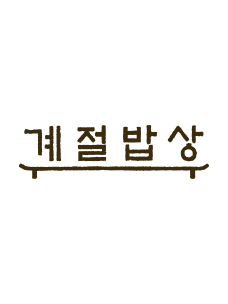 The Value of Korean Traditional Food Ingredients, Season's Table Will Deliver It. CJ Foodville's "Happiness Sharing Day" finished with a commemorative photograph taken in a picturesque wheat field. The journey to find Cripple wheat, our traditional food ingredient, was defined by a rewarding feeling. The maxim "you are what you eat" reflects our intuition that a meal made with healthy and fresh native ingredients is invaluable for life. Nothing would be better for those who have grown on this land than food which has grown on this land. CJ Foodville's staff and executives will continue to have a "special day" to deliver precious value of traditional food to more people. We look forward to your continued support and interest.